R & J Beck was a renowned British optical company based in London. It was founded in 1843 by the nephews of J.J. Lister, Richard Beck (1827-1866) and Joseph Beck (1828-1891) who were in partnership with a famous instrument maker, James Smith (d. 1870): the firm started as Smith and Beck. In 1854 the company was renamed to Smith, Beck and Beck. After Smith's retirement in 1865 the company became R & J Beck. It produced a wide range of optical products: microscopes, telescopes, trench periscopes for army officers in the First World War, eye test glasses for opticians (optometer lenses), other optical equipment, and camera lenses and even some cameras. 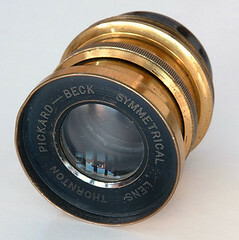 A Beck Symmetrical is quite a commonly-seen lens on British folding cameras. 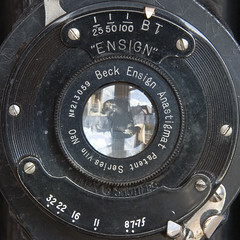 Some cameras of the Ensign brand have lenses branded as "Beck Ensign". 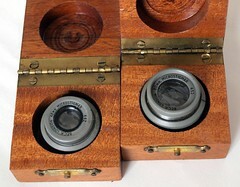 Thornton-Pickard had lenses marked "Thornton Pickard - Beck Symmetrical Lens". T. E. Lawrence (1888-1935; 'Lawrence of Arabia') used a plate camera made by Beck. ↑ In 1867-80, 31 Cornhill; in 1881-1900, 68 Cornhill. Factory at Lister Works, Kentish Town, Holloway. ↑ Spennemann, Dirk H.R. (2015) Photographic Walk-Around of the Target Aircraft Camera Dekko GW2 Mk 2 Model 2. 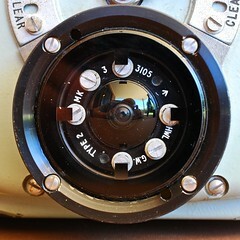 [CAMERA | TOPIA] (Albury, NSW). 6 pp. ↑ Spennemann, Dirk H.R. (2015). Photographic Walk-Around of the Target Aircraft Camera Dekko GW1 Mk 1C [CAMERA | TOPIA] (Albury NSW). 8 pp. This page was last edited on 9 November 2018, at 06:31.